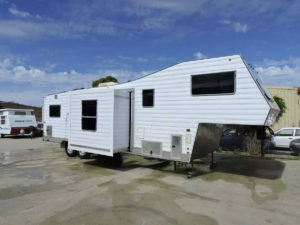 Rockingham RV is a Major Certified Repair Centre for Caravan Repairs, Upgrades, Warranty Work, Modifications, Insurance Claims, Weight Upgrades, Safety Inspections, 240V/Gas Certifications, Solar Power Systems, Lithium Battery Setups and much, much, more! Click here for our dedicated Service & Repairs website. In this next video, Jim takes you for a walk through the Jayco Westport that is just out of the workshop after a Full Rebuild. This van has been designed to be lived in as an alternative to a mortgage and it’s spacious and well layed out. 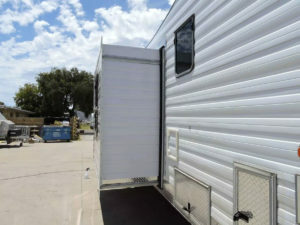 It’s something we do quite often at Rockingham RV. From a water leak to impact damage to bearings, brakes and batteries, from wheel nuts to washing machines, we have you covered. We have a Large, Fully-Equipped and Certified Service Centre providing swift and prompt professional services at all levels. We will even come to you to complete repairs (if possible) plus we pick up and deliver your van within 30km of Rockingham! 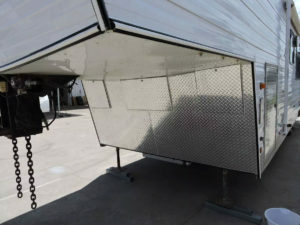 We are a warranty repair agent for Wonderland RV, Empire, Highline, La Vista, Jayco, Smev, Swift, Thetford, Dometic, Ranger RV, Northern RV Plumbing, Hilltop and many more. Distribution Agents for Camec, Coast to Coast, Transcool, Arcticold, Companion, Aussie Traveller, Evo-Lithium, Victron, Vehicle Components, Carefree and more. Certified Installers for ESC, Dexter Sway Control, Tucson, Air Command, Dometic, Thetford, Waeco and still tons more! If you have an insurance claim we can help! 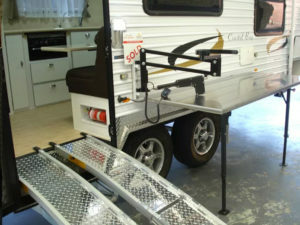 Rockingham RV are approved by ALL INSURANCE COMPANIES for repairs and maintenance issues. All you need is a claim number and we’ll do the rest. Lithium Battery Systems allow you to do a lot of free camping and allow you to manage your battery system with ease. 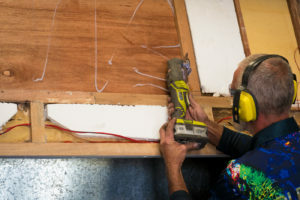 We are the first repair centre to install a Lithium Battery System into a mobile coffee van that operates 3 fridges, 2 coffee machines and 2 blenders on a daily basis without using old-style fuel cells (no noisy generator – have a coffee in peace). Lithium keeps you powered longer and optimises your battery life. It also allows you to couple with large inverter systems which backs up your 240V supply. 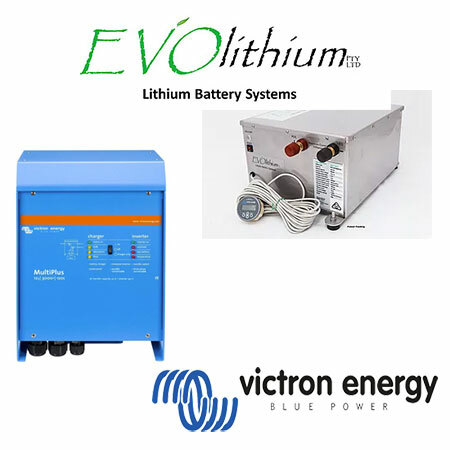 Rockingham RV are Evo-Lithium Specialists, along with Victron Inverter Systems and have been installing these systems for 4 years. 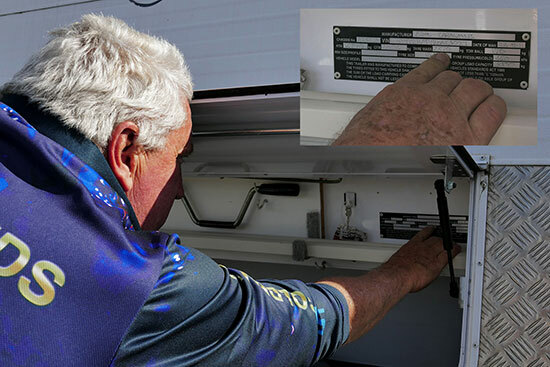 We understand exactly what your requirements will be and can install the entire system in caravans, boats or any other trailer. 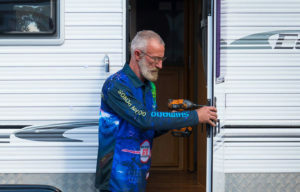 One of the things that gives us here at Rockingham RV Centre a real buzz, is being able to open the door to the great outdoors to people that have previously struggled to access this wonderful country. We had the great pleasure in constructing and fitting this wheelchair access system into a Vanguard Coastal Bay touring caravan and can do the same for you! 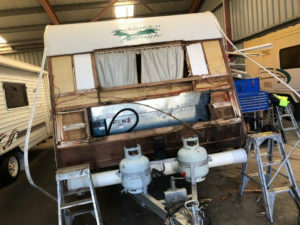 The Team was given the mammoth task to convert this 5th wheeler to include a slide out section to the dining and living area. This was a massive project with a fantastic end result. The entire project was built and fabricated from scratch. The front of the caravan had a lot of deterioration, so we re-built this area and re-plated with tough Aluminium Tig Welded Checker Plate. 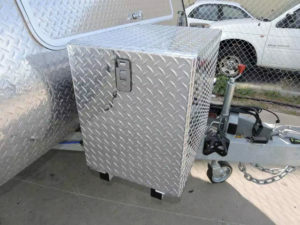 Need a box for your van? One for the generator, one for the A-Frame, one for the bumper … maybe even for the side of your van! 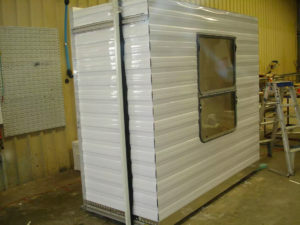 Well, you name it and we can create it, with our custom fabricators. 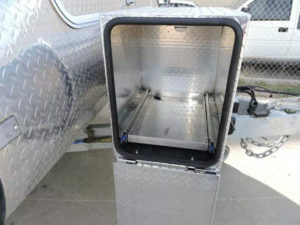 Lockable, painted, however you need it, we can design and create the right box for you. Want to buy it and do it yourself? We have a fully stocked parts and accessories shop. 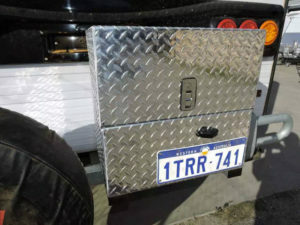 Designed and developed in Australia, WiTi replaces the cables and plugs connecting a tow vehicle and trailer with an advanced wireless interface. 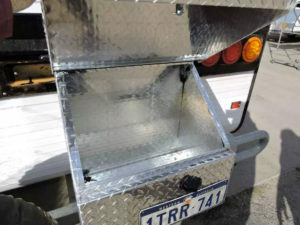 WiTi consists of a primary unit in the tow vehicle and a secondary unit in the camper trailer or caravan. Described by the industry as the greatest advancement in towing technology for the last twenty years, WiTi continues to innovate with the announcement of the WiTi integrated Proportional Brake Controller with Hill Descent Control. 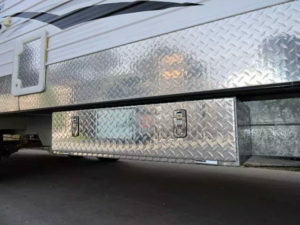 A global first for electric brake enabled trailers and caravans. 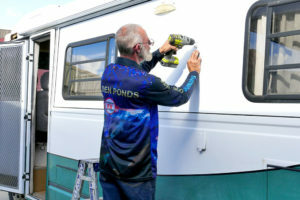 WiTi also includes a revolutionary anti-theft system and is the only anti-theft system designed specifically for caravans and trailers fitted with electric brakes. The WiTi Anti-Theft device detects movement via a highly sensitive gyroscope. 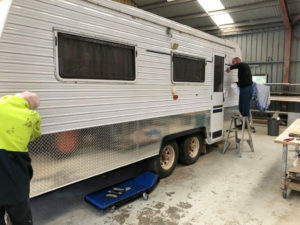 If a caravan / trailer is hitched or moved slightly whilst the anti-theft is active then WiTi immediately applies the brakes, flashes all the lights and sounds an alarm. 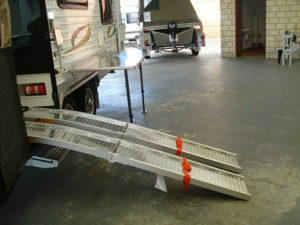 The caravan or camper trailer is completely immobilised and will be impossible to tow. WiTi Anti-Theft is included with the Wireless Interface or as a standalone product. DVK LPG Gas Detectors are Australian Designed & Manufactured. They will detect a Gas Leak and SHUT IT OFF!